Awards action: After being influenced for months by film festivals, the awards season is now being driven by awards. Last week saw a first flurry of awards activity from three high profile groups – the National Board of Review (Dec. 1), the New York Film Critics Circle (Dec. 2) and the Los Angeles Film Critics Association (Dec. 6). While none of these organizations are great bellwethers for the Oscars, they do get to enjoy their moment in the media spotlight as indicators of which pictures, filmmakers and stars might get into the race. New York based NBR, established in 1909,was the first group to hand out kudos this season. 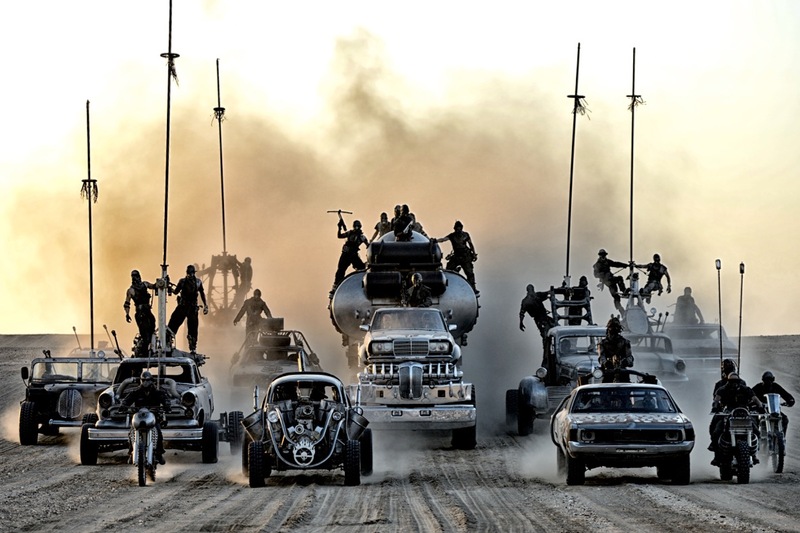 It's known for voting "out of the box"-- or going out on a limb, if you prefer --and did soonce again by naming as their best picture Warner Bros. and Village Roadshow's R rated 3D action adventure thriller "Mad Max: Fury Road. "Its director, George Miller, directed the first two "Mad Max"episodes (1979 and 1981) as well as "Mad Max Beyond Thunderdome"(1985). "Fury" opened last May 15 to $45.4 million and went on to gross $153.6 million domestically. That's a good enough showing to potentially get Academy consideration. Films that don't do well at the boxoffice typically have a hard time getting into the best picture race. On the other hand, action adventures don't usually get a lot of best picture Academy love even if they resonate with moviegoers. The same thing is generally true of comedies. Oscar voters like to think they're rewarding "serious" art with a best picture win. In "Fury,"Tom Hardy and Charlize Theron star in an apocalyptic story in which humanity is broken and fighting for life. The only chance of restoring order lies with two rebels on the run -- Max, who's lost his wife and child, and Furiosa, who's trying to cross the desert to her childhood home. "Fury's" NBR win is valuable because it will almost certainly make other awards givers take a closer look at it. Other key NBR winners will also benefit from doing well with the New York group, which is made up mostly of film professionals, movie enthusiasts and academics. NBR handed three wins to 20th Century Fox and Scott Free Productions' PG-13 rated 3D sci-fi action adventure "The Martian"and also named it one of the year's top films. Directed by "Gladiator" director and three time Oscar nominee Ridley Scott, it stars Matt Damon, Jessica Chastain and Kristen Wiig. Scott won for directing, Damon for lead actor and Drew Goddard for adapted screenplay. "Martian," which did well with critics, opened last Oct. 2 to $54.3 million and has done $220.8 million domestically through last weekend. That's exactly the kind of commercial success Academy voters applaud. On the other hand, although they do nominate sci-fi films for best picture, they don't usually vote for them to win. We saw that in 2014with the sci-fi epic "Gravity,"which lost to the serious socially significant drama "12 Years a Slave." The NBR win should help focus directing attention on Scott and that's a category in which Academy voters are more willing to reward sci-fi. In 2014, "Gravity" director Alfonso Cuaron took home the best directing Oscar. Damon's a two-time Oscar nominee for acting, but his only Oscar win was for original screenplay for "Good Will Hunting" in 1998 (shared with Ben Affleck). He's got an Oscar buzz going for "Martian," so the NBR endorsement should help put him in the race. As for Goddard, he's never been Oscar nominated so winning the NBR adapted screenplay award could get him some helpful attention as the awards season heats up. In "Martian," astronaut Mark Watney (Damon) is presumed dead after a fierce storm during a manned mission to Mars and is left behind by his crew. But Watney's survived and signals Earth that he'sstranded and alive. While NASA and a team of international scientists work tirelessly to bring "the Martian" home, his crewmates plot a daringrescue mission. Other key NBR wins went to Brie Larson for the R rated drama "Room" for best actress, Sylvester Stallone for supporting actor for the PG-13 rated boxing drama "Creed" and Jennifer Jason Leigh for supporting actress for Quentin Tarantino's R rated western "The Hateful Eight." Larson and Stallone already have a lot of Oscar contender heat going for them. Leigh could benefit from her early NBR win since "Hateful" doesn't open until Dec. 25 via The Weinstein Company and not many Academy voters have seen her performance yet. Generally, NBR best picture wins don't match up with the Oscars. Last year's NBR winner was "A Most Violent Year" while the Oscar went to "Birdman." You have to go back to 2008 to find an NBR-Oscar match for best picture with"Slumdog Millionaire." NBR will hand out its awards Jan. 5 at Cipriani 42nd Street in New York. The NY Film Critics Circle (NYFFC), founded in 1935, is a more mainstream group whose awards are generally regarded as a better barometer of how Academy members may wind up marking their nominations ballots.Actually, in the last five years NYFCC and Oscar have only matched up with one best picture winner –"The Artist" (2011). This time around the NY group applauded the R rated romantic drama "Carol"from The Weinstein Company, Film 4 and Killer Films, which already boasts a very strong Oscar best picture buzz. Its director, Todd Haynes, was an original screenplay Oscar nominee for his film "Far From Heaven," which received four Oscar noms in 2003. "Carol"stars Cate Blanchett, a best actress Oscar winner for "Blue Jasmine" and a supporting actress Oscar winner for "The Aviator;" and Rooney Mara, a best actress Oscar nominee for "The Girl With the Dragon Tattoo" and an award winner for "Carol" at the 2015 Cannes Film Festival. In "Carol,"Mara plays a department-store clerk in 1950s New Yorkwho falls for an older, married woman (Blanchett). Blanchett could wind up competing with herself for Oscar nomination votes this year since she also stars in another Oscar hopeful, the R rated biographical drama "Truth"from Sony Pictures Classics, playing opposite Robert Redford.It's never helpful to be in such a situation because votes for your work in one film vs. your work in another can easily cancel each other out and leave you watching the Oscars at home. The NYFFC also voted three other key prizes to "Carol"– best director (Haynes), screenplay (Phyllis Nagy) and cinematography (Edward Lachman). "Carol" opened Nov. 20 to an encouraging $253,510 at 4 theatres ($63,378 per theatre) and has grossed $0.82 millionthrough last weekend. It expands its run Dec. 11 and Dec. 25. No NYFFC acting honors went to "Carol,"however. Best actor went to Michael Keaton for the R rated biographical drama "Spotlight," a strong likely contender for Oscar's best picture race. Keaton's win was the only NYFFC vote in favor of "Spotlight." The nod to Keaton attracted attention among Hollywood handicappers because "Spotlight"has an ensemble cast in which no one really dominates the filmas a star. On the other hand, Keaton plays the Boston Globe reporting team's editor and has more screen time than other actors in the film. Saoirse Ronan was voted best actress for the PG-13 rated romantic drama "Brooklyn. "Supporting actor went to Mark Rylance for Steven Spielberg's PG-13 rated historical drama "Bridge of Spies." And Kristen Stewart received best supporting actress for the R rated drama "Clouds of Sils Maria,"a performance for which Stewart has already won best actress in France's César Awards. Last year, NYFFC celebrated "Boyhood" as its best picture, but Oscar voters handed their gold to "Birdman." Sunday afternoon saw the Los Angeles Film Critics Association announce their 2015 winners. LAFCA, whose first awards were given in 1975, is known for being much more contrarian– or much more eclectic, if you prefer -- than their New York colleagues. In the last five years there have been no best picture matches between LAFCA and Oscar and only two best picture matches between LAFCA and NYFFC – "The Social Network" (2010) and "Boyhood" (2014). In 2013 LAFCA raised Hollywood handicappers' eyebrows by announcing a best picture tie between the sci-fi hit"Gravity" and the indie looking sci-fi romantic drama "Her." NYFFC voters went for the crime drama "American Hustle." Academy members, however, voted their own way – for the socially significant drama "12 Years a Slave." This time around, LAFCA gave its best picture nod to dramatic thriller "Spotlight"from Open Road Films, Participant Media and First Look, giving it a big boost in terms of Oscar consideration. "Spotlight" has had a major Oscar buzz going since it played this fall at the Venice, Telluride and Toronto film festivals. Its co-writer and director Tom McCarthy, directed "The Station Agent" and was an original screenplay Oscar nominee for "Up." Starring are: Oscar nominees Mark Ruffalo, Michael Keaton and Stanley Tucci and Rachel McAdams, Liev Schreiber and John Slattery. "Spotlight"is the true story of the Pulitzer Prize-winning Boston Globe investigation that caused a crisis in one of the world's oldest and most trusted institutions. Delving into allegations of abuse in the Catholic Church in a year-long investigation, itsspecialreporting team exposed a decades-long cover-up at the highest levels in Boston. Best directing honors went to George Miller for "Mad Max: Fury Road. "Between Miller's victory in L.A. and "Fury's" NBR best picture win, the film should capture a lot more Academy attention than action franchise episodes typically receive. Early honors for unconventional contenders can influence subsequent awards races, including the Oscars, by getting voters to take the time to see movies they might otherwise have skipped. In the best actor race, the L.A. group voted for Michael Fassbender for his title role performance in Universal, Legendary Pictures and Scott Rudin Productions' R rated biographical drama "Steve Jobs. "It's a win that could put some helpful energy back in the film's Oscar campaign. After being regarded last fall as a very strong best picture contender, "Jobs" cooled off as new contenders emerged in the marketplace. As its best actress, LAFCA celebrated Charlotte Rampling for the R rated romantic drama "45 Years. For best supporting actress, LAFCA applauded Alicia Vikander for the R rated sci-fi mystery "Ex Machina. "Michael Shannon won best supporting actor for the R rated drama "99 Homes." Bottom line:Those who didn't win anything from NBR or the NY and LA critics need not despair. They may do better with three other high profile awards givers announcing their noms this week – the Screen Actors Guild (Dec. 9), the Golden Globes (Dec. 10) and the Broadcast Film Critics Association (Dec. 14).